Restaurant Reviews | ¡La Vida Es Rica! ~ Life is Delicious! After sleeping nearly 30 hours straight (ask daughter Jessica and hubby John who had to fend for themselves during my long siesta ~ however, I understand they didn’t seriously suffer ~ eating guac and sipping frosty cervezas with their toes in the sand), I’m finally settling back into my Puerto Morelos home and the routine of a non-routine. Lotsa changes since I was here briefly in October, not least of which are new restaurants ~ including several in La Colonia. Thus ~ someone has to do it? After frequenting my standby faves such as Cantina Habenaro for vino tinto and papas fritos, La Oazis for Shrimp Sambuca, Papas y Café for potato casseroles and to-die-for mole sauce, the place with no name and red tables across from the hammock shop for chilaquiles, and the other place with no name and red tables in La Colonia for tinga tostados ~ the time was right to venture out. Salc-ccia is a tidy, clean, and most unassuming place in an even more unlikely location: behind the gas pumps at the Pemex Station. Sausage ~ a choice of German Sausage, Argentinian Sausage, Yucatan Chorizo, Spanish Chistorra, Breakfast Sausage, Chicken Sausage, or Spicy Morrocan Beef Merguez. Sandwiches on freshly baked baguettes, “secret sauce,” grilled or Mexican-limon onions, dill pickles, with a plethora of additional sauce choices. Their refrescos and cervezas had to be the coldest ever, floating tiny shards of ice. And, if fresh-baked bread and tasty real-meat sausage weren’t enough? The price for this nearly-foot-long taste sensation? Twenty pesos (about $1.50). Next time I may try the homemade corn tortillas. But today? German sausage and caramelized onions on a fresh baguette ~ mmmmm! Salc-ccia, open only three weeks, is the first retail outlet of Embutidos del Camino, the sausage factory located on Cenote Road which supplies many of the resorts and restaurants along the Riviera Maya. In addition to sandwiches, Salc-ccia also sells meat by the kilo for grilling at home. After today’s pig-out on sausage ~ perhaps tomorrow I’ll try the new vegan taco place where the hardware store used to be, or Govindas with its 58-peso organic lunch, or maybe La Luna Llena, or…. 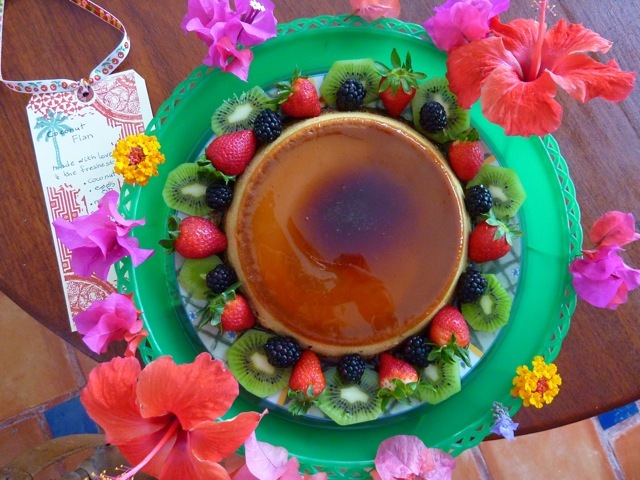 We’re on vacation – or living here in paradise – and sometimes want a special dessert yet hate to heat up the kitchen or forego beach-time– and let’s not even discuss the random nature of ovens here…. 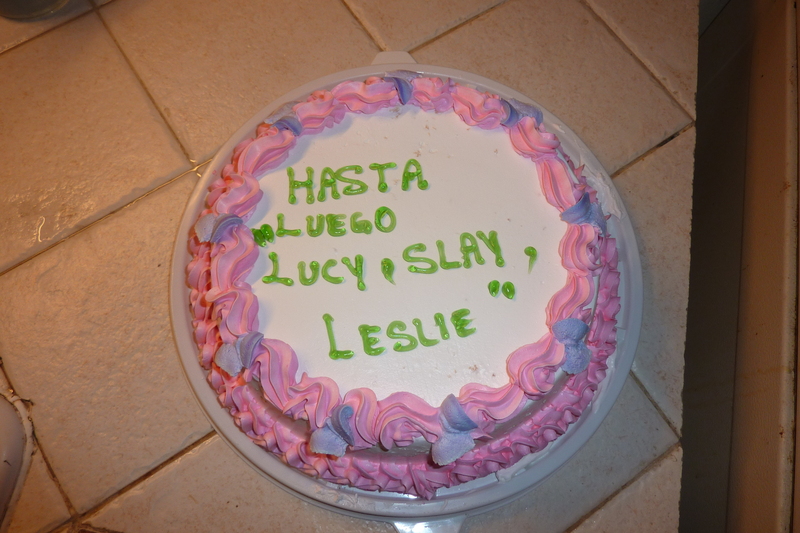 The posting on Shangai Pizza featuresTres Leche Cake, yet Puerto Morelos has other magnificent options…. Diane at Mama’s Bakery on Avenue Rojo Gomez creates yummy from-scratch cakes and desserts. For various family birthdays, I’ve personally enjoyed her carrot cake with the traditional cream-cheese frosting yet wonderfully different caramel-coconut filling as well as her banana rum bundt cake. Other offerings include coconut cake with lemon curd filling, praline, fresh apple, orange with orange curd filling, apple coffee cake – – basically, whatever-you-can-imagine. Daily, she also makes fresh yeast-breads (don’t miss her amazing flax-seed bread), sticky buns, muffins, scones, and brownies. Join her for breakfast or lunch. Her cell is 998 845 6810. Puerto Morelos also has two ice cream shops which sell in-bulk – There’s one in the “mall” by the grocery and another across The Square beside Alma Libre Book Store. Anyone knowing of other take-home desserts, let me know! Shangai Pizza –just the name makes me smile…. Although not in the actual village of Puerto Morelos – it’s on the highway by The Colonia – Shangai Pizza delivers! So one of its most attractive features is that you can enjoy its delights wherever you might be playing! Yes, it has comida China. But its true claim-to-notoriety is – are you ready for this? 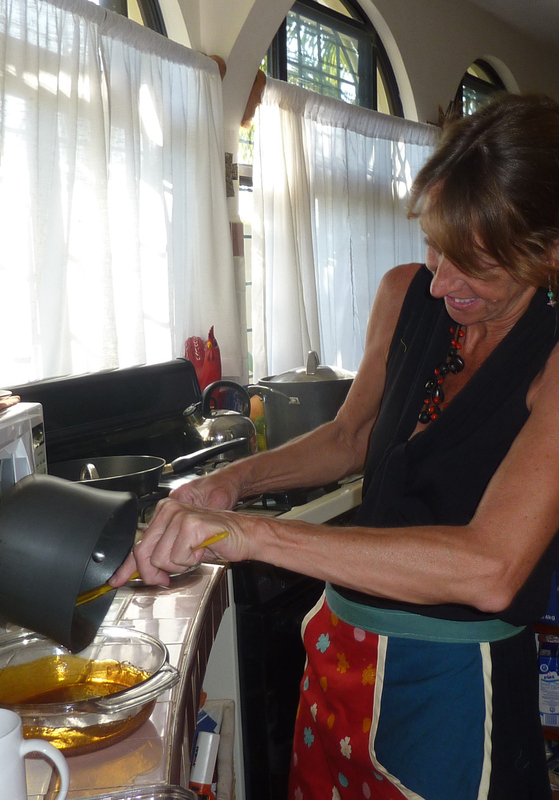 – an authentic Mexican dish that’s one of my most delectable sinful delights: tres leche cake! 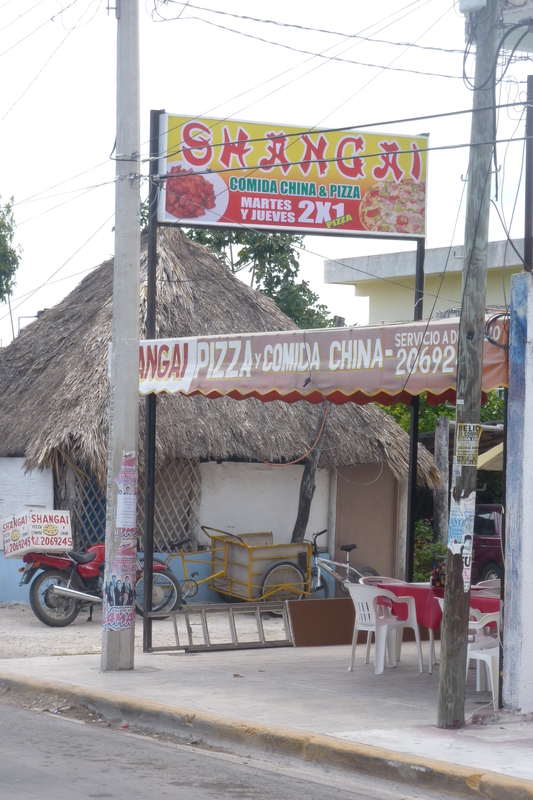 And those in-the-know here in Puerto Morelos know that the place to get it, is Shangai Pizza. I’m certain someone’s Mexican mom can make it even better, but for those of us without Mexican moms…. Since I’m always last-minute in placing my order (read: walk in, hoping they’re not sold out), I get to watch the assembly — they often have several rows of five-high stacks of pound-cakes waiting for assembly. Juanita deftly slices one horizontally and pours on the three milks (sweetened condensed milk, evaporated milk, cream), gently patting before spooning on the even creamier filling, pouring/patting once again. Then the frosting –primarily whipping cream. How does one describe such pure culinary ecstasy? Sweet, yet not overly so. Moist, moist, moist, yet still cake, not pudding. These cakes have the feel of Mexican art – created by hand with serape-bright frosting – perhaps slightly off-kelter – -and totally delightful! A taxi is about 30 pesos, round trip. 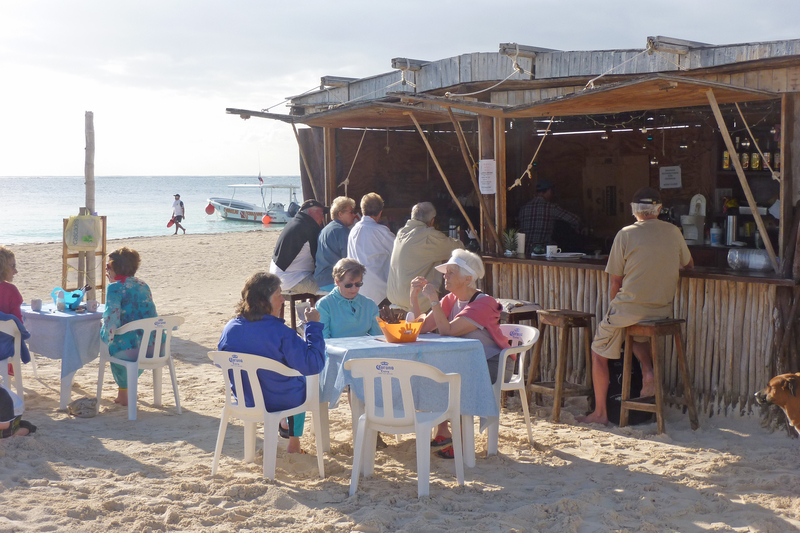 To drive from Puerto Morelos, go to the highway, taking the roundabout toward Playa del Carmen — past ADO/Paris Pharmacy, past Consultario Medico– Shangai Pizza is set back a bit from the road. Shangai Pizza is often swamped with cake orders, so although it’s not absolutely necessary, try to place your request at least a day before you need it. So far, I’ve never planned ahead and have always had luck walking in and getting one. They speak only Spanish, and my Spanish is embarrassingly non-existent, but we’ve always managed. (1) Whether you want large/grande ($150 pesos), medium/media ($130 pesos), or small/chica ($100 pesos). (2) What color or colors you want on the white base-frosting – red/rojo, blue/azul, yellow/amarillo, pink/ rosa, green/verde, etc.